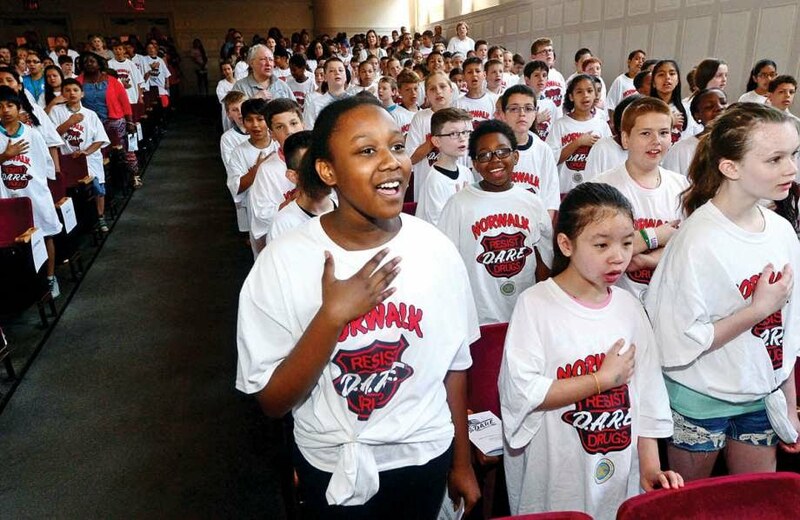 NORWALK — Nine weeks of learning to make positive life decisions culminated in a Wednesday morning graduation ceremony at Norwalk City Hall, where 849 fifth-graders celebrated their completion of the Drug Abuse Resistance Education (D.A.R.E.) program. D.A.R.E. is a nationwide program that allows police officers to teach students how to resist peer pressure and live drug-free and violence-free lives. Through visits to Norwalk’s 12 elementary schools, Officer Chris Holms, coordinator of Norwalk’s D.A.R.E. program, and his fellow officers spoke with children about alcohol and drug abuse, tobacco use, and confidence-building. “This is always an exciting day for me and for the police department,” said Norwalk Police Chief Thomas Kulhawik. D.A.R.E. officers include Holms, Officers Gabriel DeMott, Cornell Abruzzini, Freddie Kellogg, Lt. Terry Blake, Lt. Bill Lowe, Deputy Chief Ashley Gonzalez and Deputy Chief Susan Zecca. Mayor Harry Rilling addressed the graduates seated in the Concert Hall. State Sen. Bob Duff, D-Norwalk, whose son was among the graduates, spoke to the fifth-graders about making choices. Each year, D.A.R.E. students are tasked with writing essays about their dreams or goals. This year's essay winner was Lindsay Caruso, a fifth-grade student at Wolfpit Elementary School. “The D.A.R.E. officers get together and choose an essay to be read at graduation,” Holms said. Caruso took the stage and read her essay in which she outlined the negative effects of drugs, alcohol and bullying. “Bullying is a way to potentially hurt someone,” she read. Kulhawik said that the D.A.R.E. program is funded in part by Connecticut’s drug asset forfeiture law. The law allows prosecutors to file a civil action in court seeking an order to forfeit money or property seized from someone related to a drug crime. The law also requires using account funds for substance abuse treatment and education programs. In distributing forefeited funds, 70 percent is distributed to local police departments, of which 15 percent must be used for drug education, according to the Connecticut Judicial Branch. The Norwalk Exchange Club has also been a major supporter of the DARE program, Kulhawik said. Earlier this year, Holms was presented with a check for $3,750 by the Norwalk Exchange Club. Those funds were used to purchase T-shirts for students graduating from the program. Holms, an 18-year veteran of the Norwalk Police Department, has worked with the program for the last five years and teaches classes at a majority of the D.A.R.E. schools in the city. Frank Costanzo, Norwalk’s chief of school operations, offered his congratulations to the graduates and reminisced about his personal D.A.R.E. experience. The decibel level in the concert hall jumped when magician Mr. Abracadabra aka Nick Moriello took the stage. Holms thanked local individuals and businesses who have helped to ensure the program’s success: police commissioners Fran Collier-Clemons and Charles Yost, Crown Prints, First Student, Parkway Auto Body, Stew Leonard’s, Fleet Auto, and program coordinator Debra Beierle of Norwalk Public Schools. While this school year’s D.A.R.E. program is ending, Holms is gearing up for the D.A.R.E. summer camp, which he said is open to the graduates. Cost of camp is $200 for the week, Holms said.